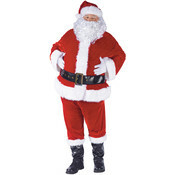 Imperial Lux-Seal Santa suit trimmed in thick white fox-like fur fabric. 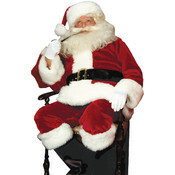 Includes- Hat, fur trimmed jacket with zipper front closure, pants, belt with 5'' buckle and fur trimmed boot tops. Sizes 50-54. 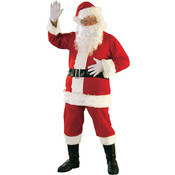 Wig, Beard & Gloves Not Included. This suit is a lighter shade of crimson. The classic getup for the holiday season. 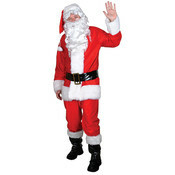 This Santa suit is a fitting outfit for extra jolliness on Christmas. 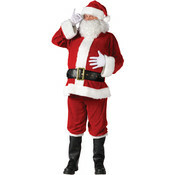 Includes coat, pants, belt, beard, hat, and boot tops. 22"-46" elastic waist. 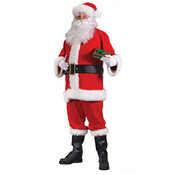 Eight piece economy Santa Suit made of flannel, a Santa hat, beard and wig set, jacket with button closure, pants with pockets, belt and boot tops. Standard Size Fits Adult Chest Size 50-54. Includes brushed knit polyester pull over jacket with back closure and belt loops, pants with side pockets, belt, hat, gloves and boot tops. Large fits sizes 40-48. Polyester. 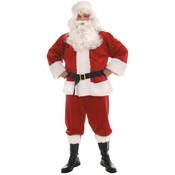 Includes plush jacket and pants with vinyl belt. One size fits most.